Today we are pleased to kick off PB author Maria Gianferrari's blog tour for her debut picture book, PENNY AND JELLY: THE SCHOOL SHOW. This is not the first you will hear of her--she has six more picture books coming out in the next two years. Be sure to enter her giveaway for a free copy. When did you decide you wanted to be a children’s author? And how did you make that happen? It’s something that I had always wanted to do, but I was a bit afraid and intimidated. Like many kidlit writers, I really made the commitment after my daughter was born. As I read her old classics that I had loved, as well as new titles that were so moving, funny and engaging, it helped to revive my dream. I enrolled in a class with author Jacqueline Davies. Then I signed up for second and third classes with her. 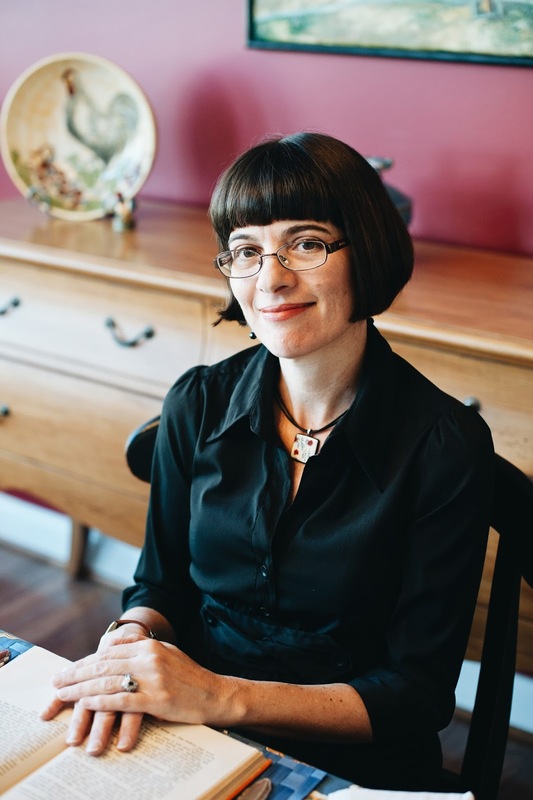 She’s a wonderful writer, a thoughtful and insightful critiquer, and a generous mentor. I was hooked. I joined SCBWI, and a critique group. I kept reading and writing and revising and I didn’t look back. I just have to add that Kidlit411 is such marvelous resource. I wish it had been around when I first got started. Thanks for all you do for the kidlit community! Congratulations on your debut, PENNY & JELLY: THE SCHOOL SHOW. What inspired this story? 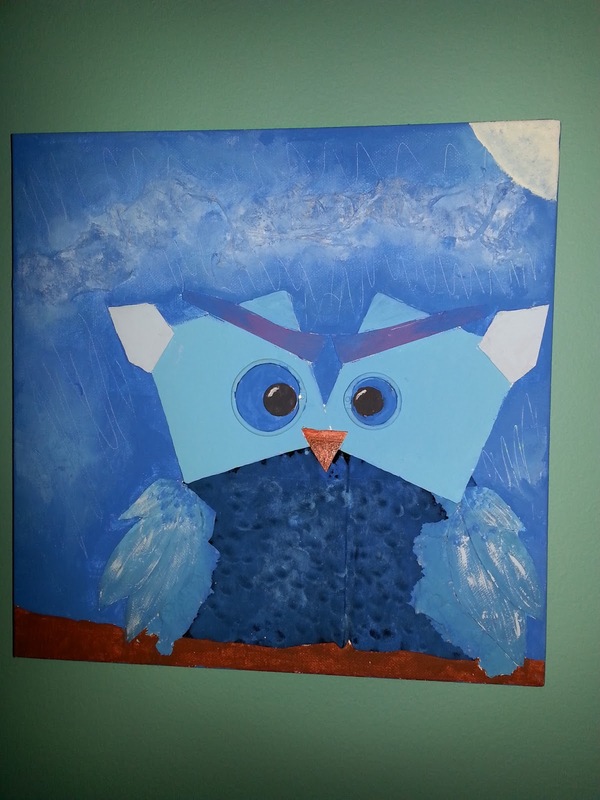 It was inspired by my very creative and artistic daughter, Anya, and her dog-sister, Becca. They’re best friends, just like Penny & Jelly. Anya’s an only child, and we adopted Becca as a rescue when Anya was four, so they’ve grown up together. Here’s a favorite photo that shows their sweet bond. 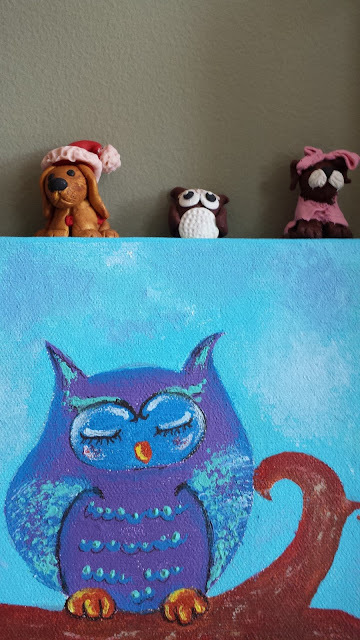 And here are two photos of Anya’s art: an abstract owl and an acrylic owl with some polymer clay creations. The one on the right is Jelly (from an early illustration when he was still brown). And illustrator Thyra Heder did an amazing job conveying the bond between the characters with the same sweetness and humor. I just love her illustrations! You have several more picture books coming out over the next couple of years. Please tell us about them. A second Penny & Jelly book, PENNY & JELLY SLUMBER UNDER THE STARS will be released by HMH in June 2016. I daresay that I love Thyra’s illustrations even more than the first book’s! See if you can find the character she modeled after me. My first nonfiction book, COYOTE MOON (Roaring Brook Press) will be published in July 2016. This title is very near and dear to my heart. It’s about a mother coyote hunting in a suburban habitat on a moonlit night to feed her pups. I think it’s safe to say that you will be as floored as I was by the artwork by Bagram Ibatoulline. It’s absolutely stunning, with intricate, photo-realistic details. I have a rather zany and humorous picture book called OFFICER KATZ & HOUNDINI: A TALE OF TWO TAILS, and Danny Chatzikonstantinou’s hilarious and quirky illustrations amplify the humor even more (Aladdin Books for Young Readers/October 2016). HELLO GOODBYE DOG:Zara says Goodbye, but her dog, Moose, only wants to say, hello, with illustrations by Patrice Barton. I cannot wait to see what she’ll come up with! Her illustrations are warm and tender and funny. HIGHWAY HAWKS: A child watches, as a red-tailed hawk scans the suburbs to feed his family to be illustrated by Caldecott winner Brian Floca! How lucky am I? I also have a nonfiction book with Boyds Mills Press, TERRIFIC TONGUES, about wild and crazy animal tongues, but a release date has not yet been scheduled since they’re still searching for an illustrator. Wow! What do you think was your secret to selling your stories? What advice would you give to aspiring writers? I am very fortunate and grateful to be represented by the amazingly gifted Ammi-Joan Paquette of Erin Murphy Literary! Don’t give up and keep working on your craft, and build your connections! Writing is a journey, and it can sometimes be a long, uphill and winding one at that. I first met Joan in 2009, when my manuscript Terrific Tongues was a winner of PEN New England’s Susan Bloom Discovery Award. At the time, I only had two submission ready manuscripts, both of which were nonfiction. The timing wasn’t quite right for representation right then, but Joan invited me to re-submit and her words were very encouraging and kept me going. So, I worked more on my craft: wrote new manuscripts, revised them, and revised them again, and approached Joan in August 2011, this time with seven manuscripts in hand. She was interested, but had some more revision suggestions. I worked on revising several of them over the course of a year, and signed with Joan at the end of August 2012. My mornings always start with a huge mug of tea, and a neighborhood walk with Becca. During my walks I sometimes figure out plotlines; lines or images or new manuscript ideas pop into my head. I just get in a rhythm and take in the natural surroundings, the birds and trees and flowers. Then I usually take a brief nap, followed by more tea and a late morning start. I have a daily writing journal that I start out with. I write mostly mundane kinds of things—what I’m happy or anxious about, a to-do list (like Penny, I’m an obsessive list-maker), general writing ideas—nothing profound, and yet it helps me to feel more centered. I started it in June 2004. I try to write in it every day during the week, but I often miss chunks when we’re traveling, or on vacation, or when things are just plain busy. I just checked—it’s 993 pages long, single-spaced! From things I observe in the natural world. From books or articles that I read, or movies I watch that move and inspire me. From questions I’ve been pondering or from snippets of conversation—ideas are everywhere. I’m in full idea generator mode in November for Tara Lazar’s PiBoIdMo (picture book idea month). I have relatives in northern Italy, in the province of Emilia-Romagna, who are dairy farmers. I’ve visited many times over the years, and have very fond memories—it feels like it’s a huge part of who am I today. This is my cousin’s farmhouse, right next to the one where my Nonna, my paternal grandmother, was born, so it holds a special place in my heart. When I was 13, I spent the summer there, and I came back to the U.S. feeling more Italian than American. Another highlight during a stay was helping a cow give birth to her calf—an unforgettable experience. I also have an author page on Facebook. Thanks so much for having me on Kidlit411!! Great interview! loved hearing more about Maria's writing journey. I can say from experience that Maria is supportive and encouraging of other writers. I see her on social media sharing happy news and information for writers. She's a wonderful online friend! Thank you, Penny! <3s to you!! Great interview Maria! I loved learning more about your journey. And as you know, I am in awe of the number of contracts you got in such a short time frame, well, after years and years and years of hard work! :-) You will be busy promoting in the next three years - when will you find the time to write?! Can't wait to read Penny and Jelly. Thank you, Deb--good luck on all your NF! Maria, Thanks for sharing your new PB with us. It's amazing to have so many stories under contract. Penny and Jelly look like fun characters. I look forward to meeting them. Loved reading your interview, Maria! Can't wait to see P&J on my bookshelf! Great interview, Maria. I'm looking forward to having P&J, too! Loved finding out about your Italian roots! 6 book deals, that is awesome! Penny & Jelly is such a special book and I am so excited for the bright future you have ahead of you! Your dedication shines! Thanks for your kind words, Carrie & all you do for the kidlit community! I am so impressed with how many books you have coming out! Congratulations! Sounds like a hugely successful couple of years for Maria! Congratulations on all her successes! All those books sound fascinating and I look forward to reading them. Thanks for the giveaway! SO cool how many books you have coming out. And loved the interview. THANKS! Thank YOU Joanne for the shout out too! Maria is so hard-working, authentic, and smart! She's a wonderful role model for aspiring authors and a great member of the kidlit community. I love reading picture book author success stories. Keep writing and inspiring other #kidlit writers. Wishing you continued success! Wow, what an amazing writing journey you are on! Thanks for giving me an insight into your working process, I love how diverse your writing is! All of these titles look wonderful. Look forward to reading them! Congratulations. Thanks for all these insights into your process and your progress. Very Inspiring. Thanks so much for sharing your talent with us, Maria!! !